Everyone knows that the Punjab Nahi Jaongi actress Mehwish Hayat is a brilliant actor but not many knew that she could sing well too. Ever since she appeared in the Coke Studio, her number of fans has increased and her melodious voice has more to do with that, than her acting skills. 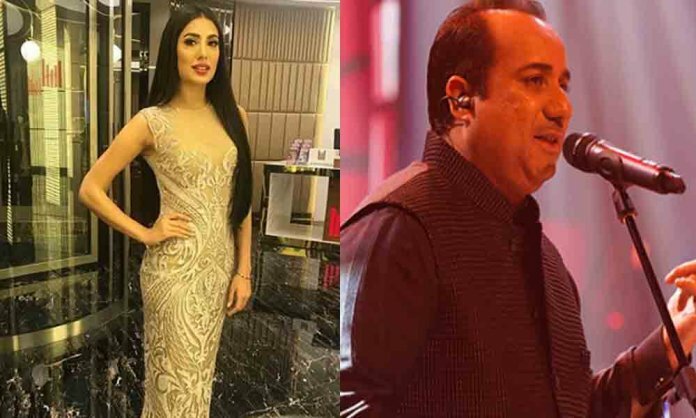 However recently, the actress performed at Haveli Barood Khana and that too with the legendary singer Rahat Fateh Ali Khan and made audiences go gaga over them. The audience absolutely loved the duo and their voices were soothing to the ears. They sang the cover of Nusrat Fateh Ali’s ‘Tu Mera Dil’ song together and we are sure no other singers could’ve done justice to it. The vocals by our very own Mehwish Hayat voice match the Ustaad Rahat Fateh Ali Khan and two form an unlikely pair that clicks. They just wowed the audience with their vocals! We absolutely loved the chemistry between them and it already made us impatient for their concert together. Other than Mehwish and Rahat Fateh Ali Khan, Aima Baig and Ali Zafar also performed and they opened by singing their hit song ‘Sajna Door’ from Teefa In trouble. #AliZafar and #AimaBaig singing Sajna Door last night at Virsa at haveli barood khana for PTV . Next articleMahira Khan Shuts Down Troll Over Viral Pictures With Ranbir Kapoor!